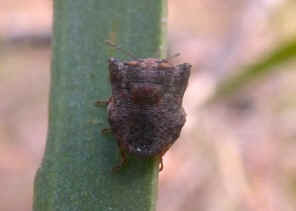 This page contains pictures and information about Small Brown Stink Bugs in Subfamily Podopinae that we found in the Brisbane area, Queensland, Australia. 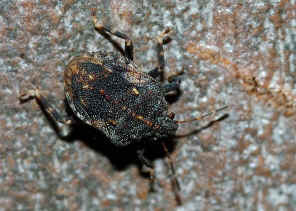 Stink bugs in this Subfamily Podopinae are usually small in size and brown in colour. They have very large scutellum which cover most of the abdomen. We first found this bug on gum tree trunk in Alexandra Hill during early summer. 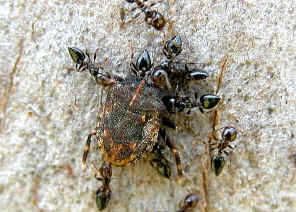 The bug was small in size and dark brown in colour. Its U-shaped scutellum covered up to abdomen tip. We have more information and pictures in this page. 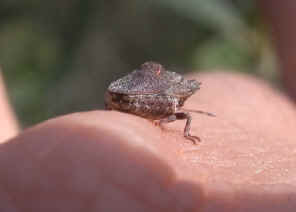 This very little Stink Bug was found on acacia leaves in Karawatha Forest. Please check this page for more information. 2. Plant-feeding and Other Bugs (Hemiptera) of South Australia. Heteroptera-Part I - Gross, G.F. (1975). Adelaide: A.B. James, p125.